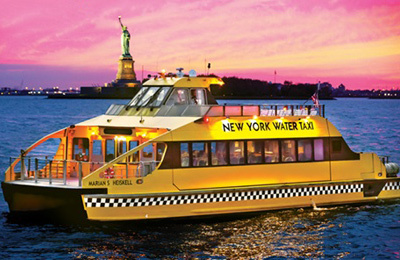 Book with New York Water Taxi simply and easily! 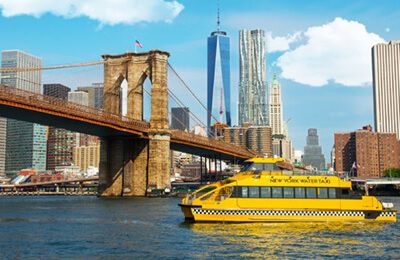 You'll love New York Water Taxi! Explore New York City from its rivers, you will surely have a great time! The New York Water Taxi (NYWT) ferries offer you the perfect opportunity to enjoy unparalleled views of New York City, at the same time that makes you easy to visit this emblematic city. Hop on and hop off the water taxis at any of the available docks along the famous Hudson and East Rivers, and live an unforgettable experience! The ferry operator New York Water Taxi owns a fleet composed by 12 ferries that are divided into 4 different classes, like the "Durst Class Water Taxi" and the "Berger Class Water Taxi". Some of the boats have been named after some of the New York's dock unsung heroes. The Ed Rogowsky, Gene Flatow, Marian S Heiskell, Sam Holmes and Seymour B. Durst ferries are 67.1 feet long, were designed in Sydney and can carry up to 149 passengers at a maximum speed of 28 knots. The Curt Berger, John Keith, Michael Mann, Mickey Murphy and Schuyler Meyer Jr ships are 53.3 feet long, were designed in Southampton and can carry up to 74 passengers at a maximum speed of 24 knots. The New York Water Taxi ferries have plenty of seating, audio and video systems, bar and two levels deck available for up to 149 people, depending on the boat. All the ships have climate controls and access for disabled passengers. You can bring a bicycle on the New York Water Taxi only if the space allows it. "Assisted life" and "seeing eye" dogs are allowed on board but no other animals are permitted. All the boats and docks are accessible to the disabled passengers. Wheelchairs do not have access to the top deck. Outside food and beverage are not allowed. If the weather conditions are bad the passengers will be sitting inside the climate controlled cabins. The All-Day Access Pass allows you to see the entire city of New York and the New Jersey skyline. Enjoy 360 degrees views of world famous landmarks like the Empire State Building, the Statue of Liberty and many more! You can customize your itinerary by completing it in 90 minutes, or going at your own pace, hoping on and off as many times as you like at any of the six available docks. Located at 459 12th Ave and West 39th St, at The Hudson River. Located at Christopher Street, opposite West 10th Street. Located at 75 Battery Place, on the southern tip of Manhattan at Battery Park. Located at 11 Bush Terminal Yard. Located at Brooklyn Bridge Park, DUMBO. Located at Van Brunt Street. How long before departure should I arrive for New York Water Taxi?